Location: Kyle of Sutherland, Scottish Highlands. Notes: Carbisdale Castle was built in 1907 for the Duchess of Sutherland on a hill across the Kyle of Sutherland from Invershin in the Scottish Highlands. 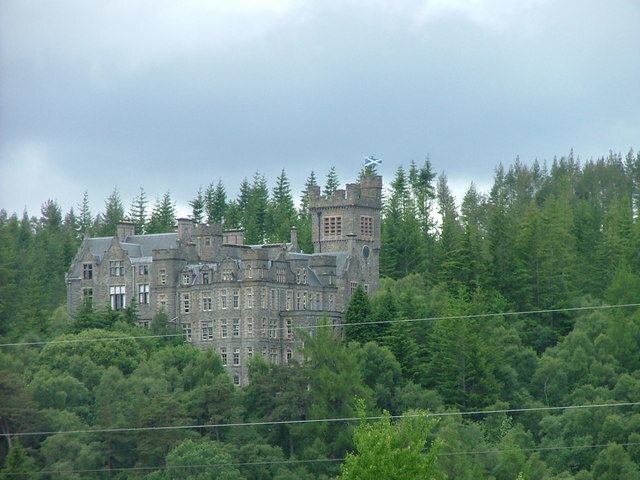 Until 2011 it was used as a youth hostel, operated by the Scottish Youth Hostels Association. The castle is situated north of Culrain, and around 5 kilometres (3.1 mi) north-west of Bonar Bridge. The castle is in the Scots Baronial style, and is protected as a category B listed building. The hostel closed for repair in 2011, and as of August 2014 was put up for sale for 1.2m. The castle has 365 windows, and the clock-tower only has clocks on three sides: the side facing Sutherland does not have a clock. There is a secret door below the Great Staircase which could be opened by rotating one of the statues. This mechanism is no longer in use. Until its closure, the castle had a large collection of art, with some pieces dating back to the year 1680, as well as the Italian marble statues. The castle is said to have several ghosts. Paranormal experts have investigated with varying results. The appearances include a lady in white, fallen soldiers of the Battle of Carbisdale (1650) and the sounds of a piper. The ghost of the castle gardener, known as "The Hooded Gardener", is said to roam the grounds looking for his lost daughter. He is said to haunt girls that are the same age as his own daughter (15), and has reportedly been seen dressed in black, with a black hood and only part of his face shown.